Picture this: A perfectly planned investigation, no unusual chemicals to hunt down, eager students, no complaining, and all actively writing down their science thoughts……sound too good to be true? It is, but maybe not for the reasons you’re thinking. Two weeks ago I wrote a post about introducing my students to 3-dimensional learning using the investigation “Reaction in a Bag.” Now that all my quizzes are graded I’ve decided to write the reflection over how my students did with 3D learning, the thoughts of my two teaching peers who taught this way for the very first time, and what’ll I’ll do better next time (and not just next year “next time”). What’s got me singing the lab blues? Exhaustion, frustration, and well my belief that it will be better next time. 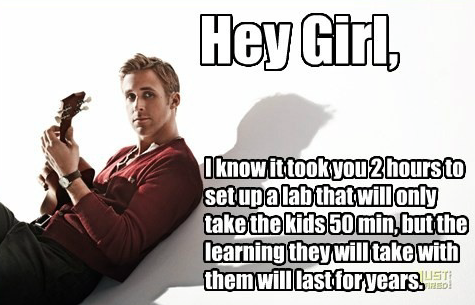 We all know students can’t wait to do a lab. They beg for them starting day 1, “Mrs. J, when are we going to do a lab?” “Please can we do a lab?” I have 3 preps this year (Chem 1, 2 and college prep) so my Chem 1 classes have seen the set up for the others and have been particularly eager. Last week the time had finally come for my classes to do a lab….all of them….at the same time….over multiple days. (Side note: we’ve been doing labs all semester but I’ve been able to stagger them….unfortunately not this time) To say the week was stressful would be an understatement. First, I want to say I work with amazing colleagues who help with set up when they can, but even with their help managing three different labs was a bit much. Chem 2 is working on Collision Theory and the conditions that affect reaction rates, CP Chem is beginning heating and cooling concepts, and Chem 1 is focused on mixtures, solutions, and chemical/physical changes. The only thing these labs had in common was a ring stand lol If you’re a teacher that has to set up labs I don’t have to tell you about the amount of time required to set up for ONE lab, let alone three! (It’s HOURS, for everyone else) Thank you Ryan Reynolds for knowing my pain…. “Why does this matter?” “How does [insert any subject here] even relate to my life?” “Chemistry has zero relevance in the real world.” Do these sound familiar? That last one is a real quote from a parent email to me during my first year of teaching; ah! It’s so easy to think of these questions as “dumb” questions; I mean really, did you really just ask me how science even relates to your life?! Did you brush your teeth? Wash your hair/body? Eat food? How’d you get to school? Are you breathing? Are you tired? Mad? Happy? Sad? ALL OF THIS INVOLVES SCIENCE! Now to make it clear responding with “That’s a dumb question!” and then following up with the above remarks is probably not the best way to approach students asking the question “why does this matter?” Students do not ask this question to be spiteful….okay maybe some are but most of them are genuinely curious as to how [insert any subject here] is relevant to them. They just don’t see the connection between cells and life, history and citizenship, the Periodic Table and explosions, etc… It is our job as teachers to help students make this connection; to show them why understanding the basics of English, History, Art, Foreign Language, and Science are so important. This conundrum I was confronted with during my first year of teaching was the starting place for Molecule Monday’s but I wasn’t aware of it just yet. Fast forward to the end of my 4th year of teaching. During Tiger Talks (my school’s version of Ted Talks; implemented during some of our professional days; yes it’s awesome), one of my amazing teaching peers presented and let me just say, this teacher is brilliant. Students love him, his classroom is always full (before/during lunch/after school) and he teaches Physics! During his presentation he talked about dark matter, with his ideas starting from watching water on a trampoline! I remember one of his points was about engaging students, and in his classroom he used Flashback Friday. He would play songs from all decades and the students would try to guess the song. Implementing something fun in my room to engage students sounded like an awesome idea. I went into the summer determined to come up with something. Every Monday I introduce students to a new molecule. Student’s enter class while science-y themed music is playing (Weird Science and She Blinded Me with Science) and on the board is the molecule (to show how substances have different shapes) with products the molecule is a part of. When class starts, I give a little background information then play a 3-5 minute video. There is no quiz later. Student’s don’t have to remember any of the information I present. Molecule Monday’s is simply a way for me to show my students how science is relevant to their lives. My student’s LOVED it last year! They’d even ask questions after the videos. If I missed a Monday, I would get asked all week if we were going to make it up. It made me so very happy to see that the student’s loved this new creation of mine. My goal this year is to not miss a single Monday. I have already collected all the information I need for the Fall semester and I’m half-way done with the Spring! I idea for something else as well 🙂 I teach both Chem 1 and Chem 2 so I’m going to eventually need something different for my Chem 2 kiddos. Have you implemented something fun in your classroom that connects your classroom topics to the world around your students? I’d be interested to hear what you’ve done! This year one of my goals was to incorporate quick formative assessments to check for student understanding. Exits slips seemed like an easy place to start and I have learned to love them! Over the summer while perusing Pinterest (I LOVE this site!!) 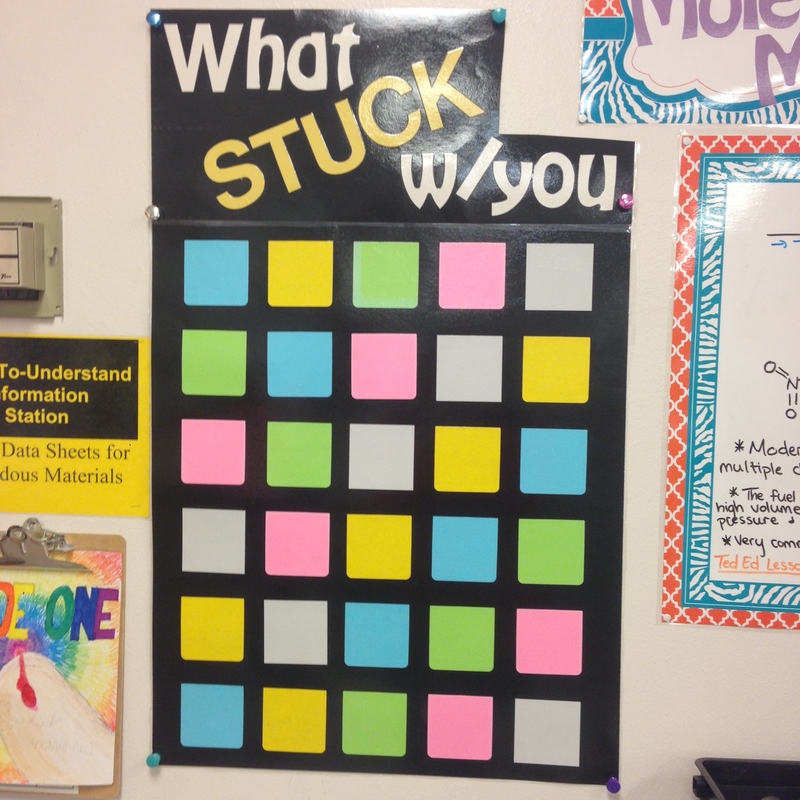 I came across an awesome poster board (see below) made with sticky notes then laminated for easy re-use. I used sticky notes with a fully sticky back so that the poster would easily slide through the laminator. 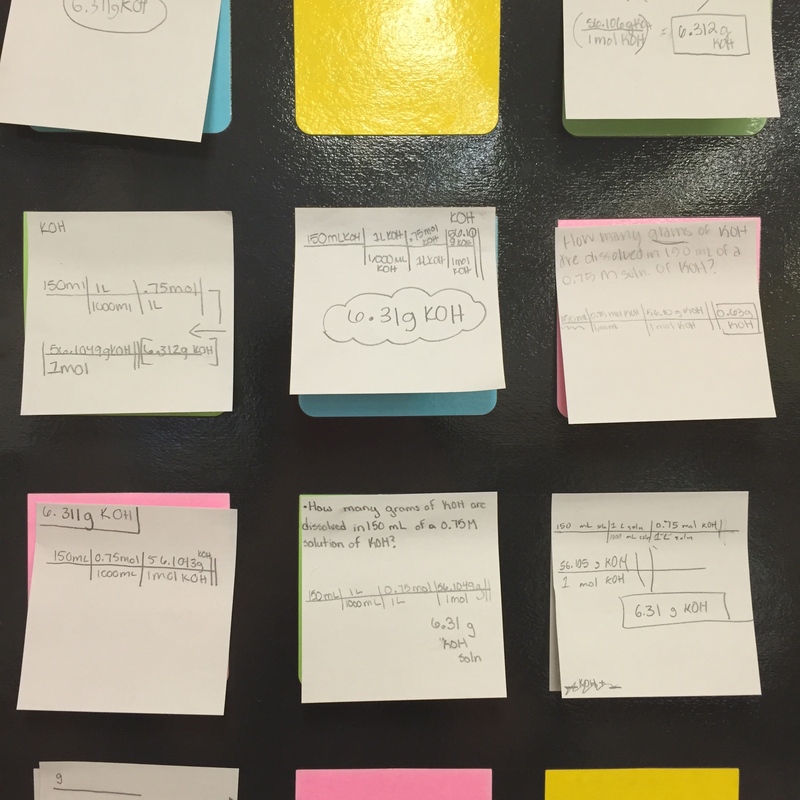 Students “stick” their exit slips to the squares in a nice orderly fashion and my OCD side is happy! lol I have students write their names on the back of their sticky note to keep their answers anonymous. I love how I can just look over the board and get a general idea of where the class is on a concept. “What Stuck w/you” isn’t the only heading I use for my exit slip board. I’ve come up/found a few other ideas that I like to use to keep it from becoming monotonous. Parking Lot – Student’s leave a question on the board which will be their starting point the next day. 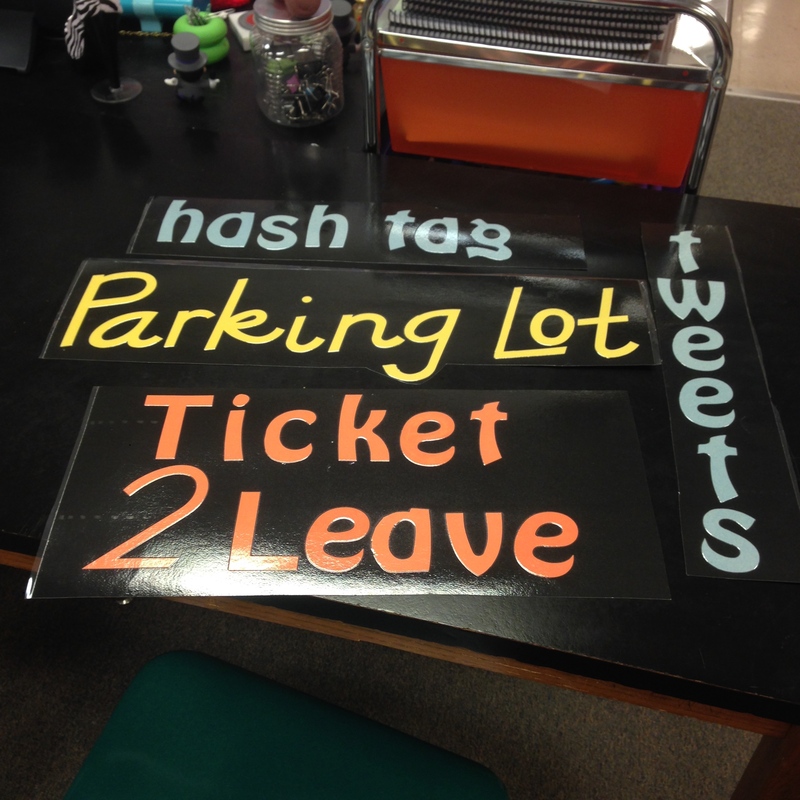 Hash tag – students love to “#” everything so with this exit slip they must come up with a three-four word summary of what they learned in class that day/key concepts. Tweets – using their favorite form of social media, students write a summary in 120 characters or less (bonus points if you can get them to really tweet out their thoughts!). Ticket to Leave – I like to have students come up with Movie/Concert titles. I also really like the 3-2-1 Method where students write down 3 things they learned, 2 interesting facts, and 1 question they still have. I haven’t used this one yet but hope to incorporate it with our readings. 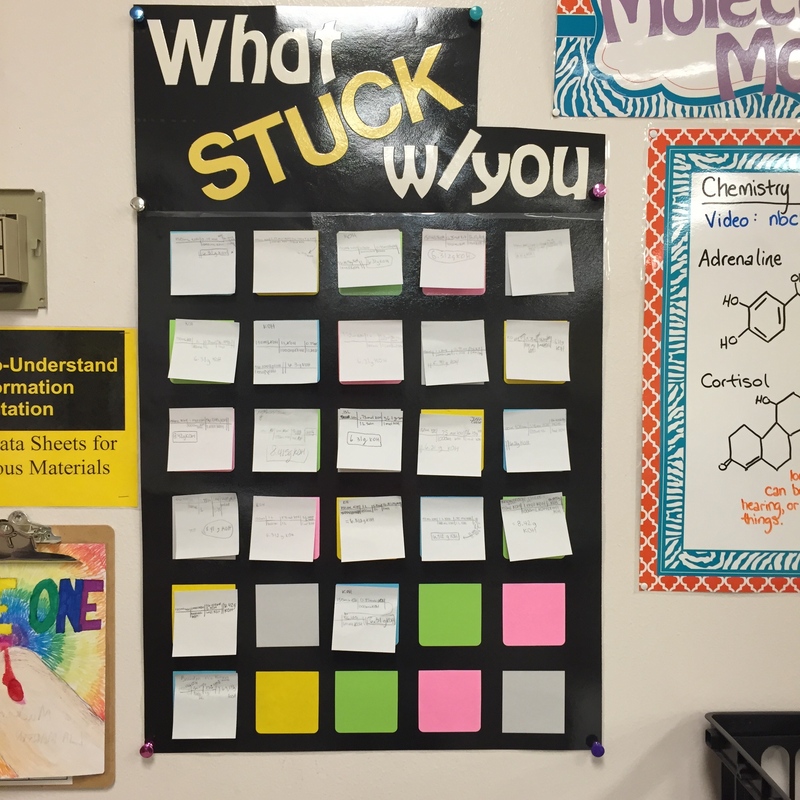 How have you used exit slips in your classroom? Any helpful suggestions or ideas on keeping exit slips as a useful tool in the classroom? Oh standards. What a frustrating topic. Teachers work very hard to align curriculum to new standards just for them to change the year implementation is supposed to occur. In my short 5 years of teaching I’ve learned this really is a norm in education (sadly 😦 ) so I’m going to avoid the politics that coincide with this topic and talk about how I’ve learned to interpret the standards and use them in my classroom. I’ve always been aware of the PASS Process Skills and Standards for Science. In my first year of teaching the District I work for began implementing the Next Generation Science Standards and wanted us to find a way to incorporate more writing in the science classroom to align with Common Core. Needless to say standards have always driven my classroom instruction. Great right? Well when I reflected on my use of the standards there was plenty of room for improvement. I knew what the State required students to learn. I knew why the students were doing a particular assignment. I knew. I knew. I knew……but what about the students? It’s great that I know what’s going on but shouldn’t the student’s know too? You could ask a student what our topic was in class and he/she could (hopefully) tell you but I doubt he/she could tell you why we were doing something in particular. Think back to when you were a student, how many of you loved the syllabus in college? I know I certainly did. It outlined exactly what I was supposed to know and what the topic was going to be each time we met. Knowing this information helped me focus during lecture so maybe if my high school students knew what concepts we were going to learn it would help them. This was reason 1 for looking into how I could use standards more deliberately in my classroom. Step 1: Once you have chosen a standard you need to identify the goal as declarative (informational) or procedural (skills, strategies, processes) knowledge. Generally, standards that require students to know specific information contain the words “students will understand” while standards that require students to show specific skills, strategies, or processes contain the words “students will be able to.” The new OASS for Chemistry all contain the terms “students will be able to” and thus are procedural standards. There are instances when standards can be both procedural and declarative. If you come across something like this remember to break it down into the two pieces so that you address both parts. Example: The above scale is based on the following standard that addresses procedural knowledge – Student’s will be able to construct and revise an explanation for the outcome of a simple chemical reaction based on the outermost electron states of atoms, periodic trends, knowledge of chemical properties (Periodic Table trends), and formation of compounds. Step 2: Determine the standards’ level of complexity by using either Bloom’s Taxonomy or Marzano’s Taxonomy (yes he has one). I actually use the New Taxonomy developed by Marzano because it is broken into only four levels of difficulty and he provides a list of common verbs that are used in each level (which helps when writing a learning scale). Example: Look for the verbs in the standard and find where they would align in the taxonomy – Student’s will be able to construct and revise an explanation for the outcome of a simple chemical reaction based on the outermost electron states of atoms, periodic trends, knowledge of chemical properties (Periodic Table trends), and formation of compounds. At this point you have identified what type of knowledge your students must learn and how difficult the State expects it to be. The verb “construct” can be a way to symbolize information so is Level 2 Comprehension and the verb “revise” can be a way to analyze errors so is Level 3 Analysis. The standard is the Learning Goal for the class. If you were to develop a learning scale the learning goal would be your #3. Students should always be aware of their learning goal. Using the above example students would know that they must be able to show their understanding of the standard by constructing something and revising something else. I would build upon this by completing the scale and then tying my formative and summative assessments to the verbs in each statement. Scale development will be the topic of another post. This one is already quite long! My students seem to like having the standard “unwrapped” for them. As the year goes on I hope to involve the students in Step 2 – I’d like for them to identify the verbs in the standard and brainstorm ways to assess their understanding based on that information. We shall see how it goes. As always if you have questions let me know! ****As a reference outside of the conferences I attended this summer I read: Designing & Teaching Learning Goals & Objectives by Robert J. Marzano. This was a great resource! School decisions are driven by data collected from student, parent, staff, and community perceptions, culture, demographics, and socioeconomics, State testing, A-F School Report Cards, ACT Scores, SAT Scores, and many, many more I’m sure you can include with this list. Unfortunately most data that describes a teacher’s classroom is out of a teacher’s control, teacher’s are provided very little training in understanding data, and so much value is given to numbers we know do not describe our “whole” students. We begin associating negative feelings with the term “data” and unless something breaks this bad cycle teachers will miss the power behind the numbers. 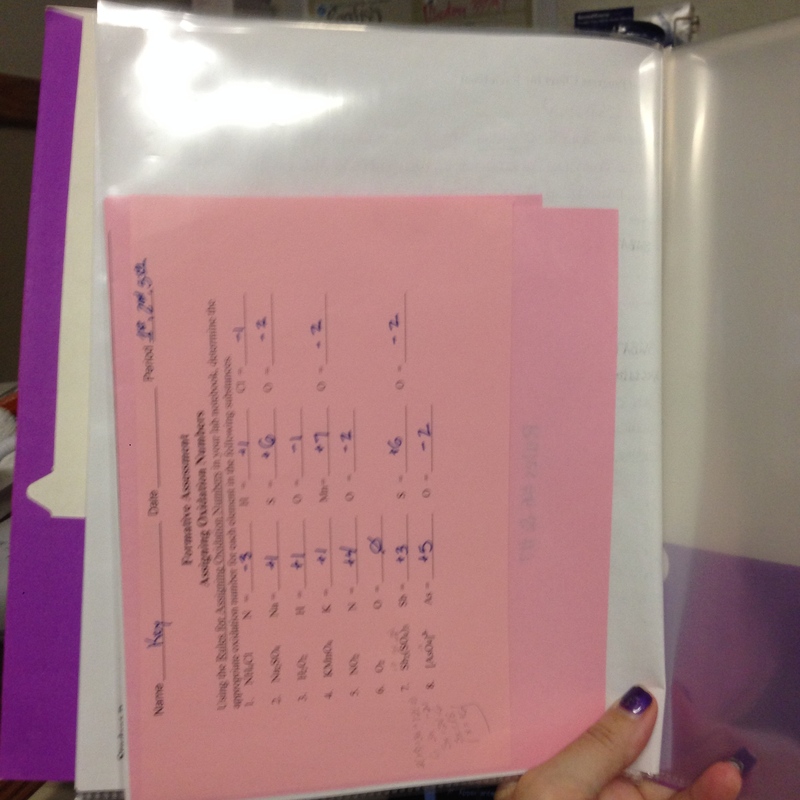 I hope to shine positive light on using data in our classrooms by introducing my Student Data Folders. Is this THE answer to all your data questions?!?! No probably not but was this my answer to how can I make data relevant to my classroom? To me? To my students???? It was my answer to why should students even care?! Students should care about data that informs them of what they do and do not know about course concepts. Students need help in identifying the important information. They need difficult concepts connected to information they do understand so that bridges can be built over learning gaps. And I feel it is my job as their teacher to LEAD them in building their bridges – not DIRECT them. My connections may be different to theirs and that’s okay. What I want my students to know, understand, and remember is that I will be there to always support them, I was a student once, and this folder is in no way a “gotcha” activity. I started this out by developing the following lesson and corresponding assignment. I think it worked out really well. Students slowly opened up about their initial feelings on how they defined the terms failure, quitting, and making mistakes. I made sure to include what those words meant to me when I was a student, what they meant to my parents, and how their differences effected my relationship with my parents. Once our discussion was over we watched clips about famous failures, a video about quitting titled “What If”, and famous mistakes. After the videos, I let the students make connections between our three original terms and the videos. I wanted them to include their new definitions in the other boxes and to keep this piece of paper at the front of their Student Data Folder. I wanted this to be their reminder that failing is okay, quitting is not, and making mistakes are the beginning pillars of success. 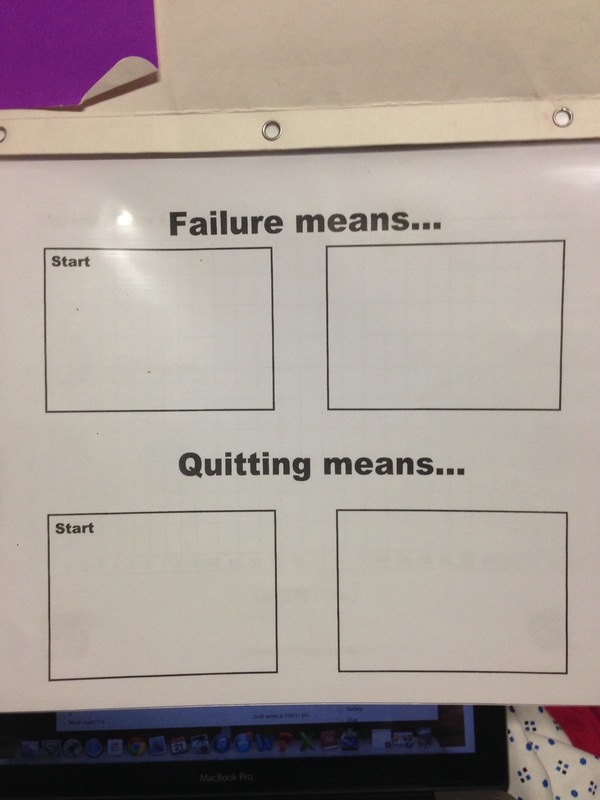 This is an L to J Student Chart, developed by a man named Lee Jenkins, and built on the premise that students are not given permission to forget. I have chosen to use L to J Quizzes in my classroom designed around vocabulary for the semester. Students take weekly “quizzes” over the current semester terms. They get 10 questions each time and they may or may not have learned these terms yet. L to J focuses on terms they do get correct; we celebrate their successes! The goal is that towards the end of the semester they will see that the number of terms they get correct continue to increase – proving they are learning! I will take some updated photos of student charts as the semester moves along. 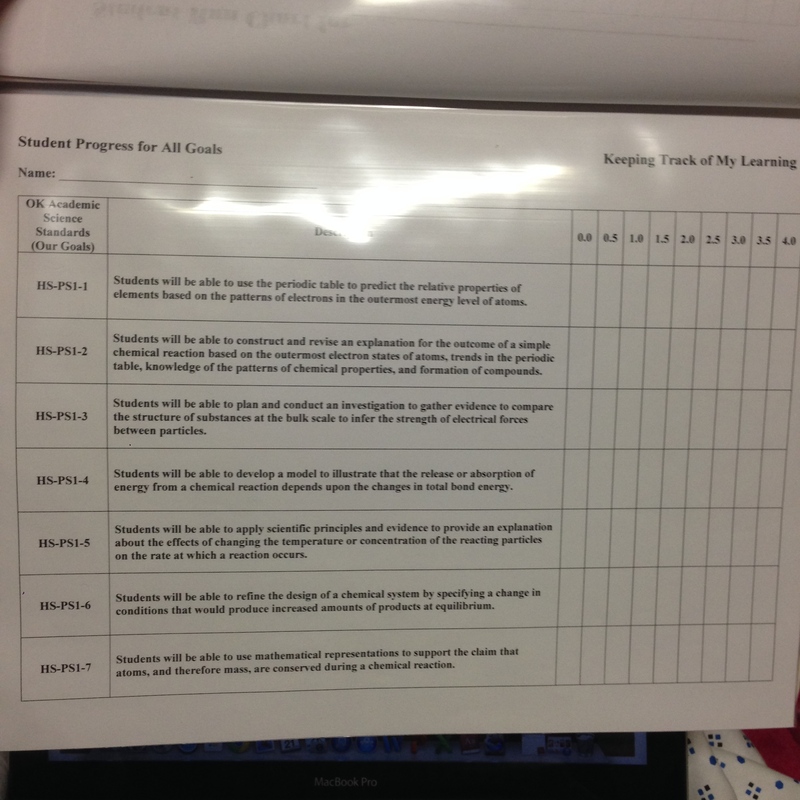 This is a Student Progress Chart for Each Goal – Keeping Track of My (Student) Learning. 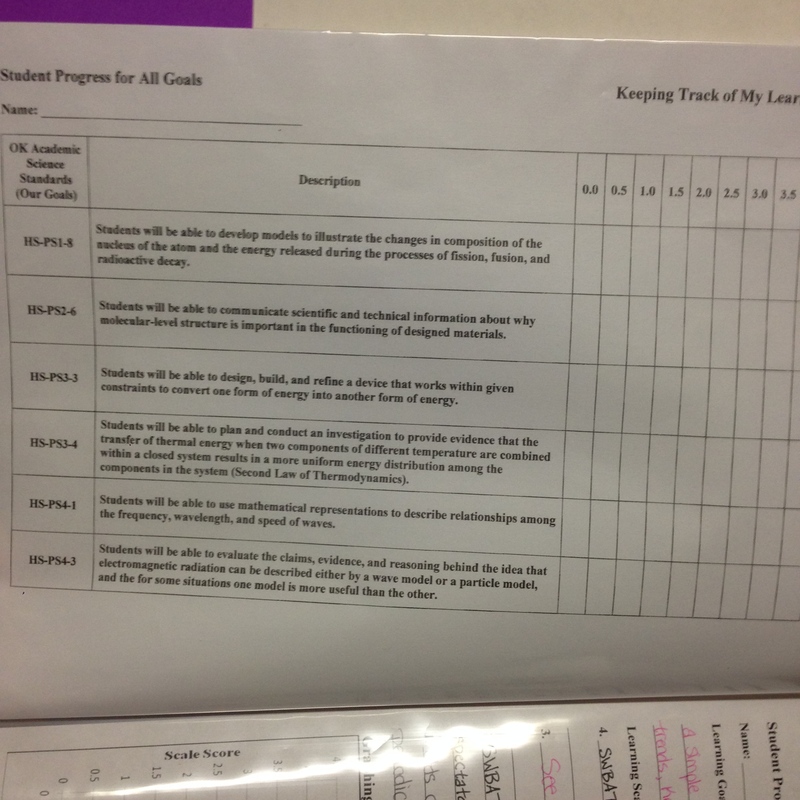 This chart identifies the learning goal, learning scale, daily targets, and provides a graph for ALL formative/summative assessments with a legend. Students will also keep ALL assessments behind this progress chart so that come test time everything they will need is there! 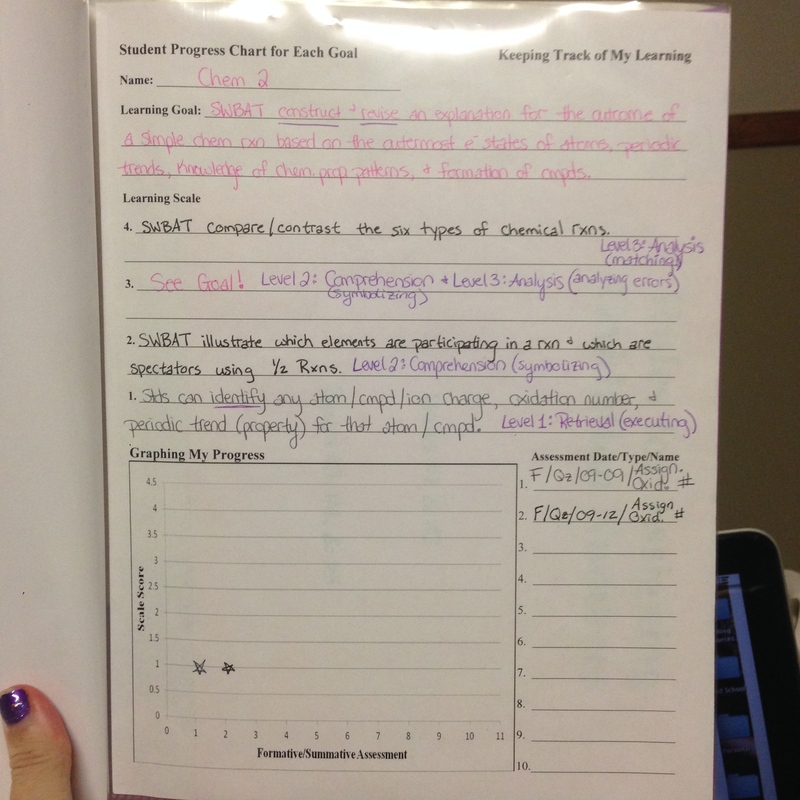 I’m using group assignments, group discussions, 3D note-taking (foldables), mini-quizzes they grade, ticket’s to leave, and many other teaching techniques as assessments. The assessments measure only one part of the learning scale (the daily target), which has been throughly discussed so that students know exactly what I expect them to be able to do. The plan is that this will allow them to begin to work their way towards the learning goal (a level three, or a “B” on the scale) and hopefully to a level four (the A!)! 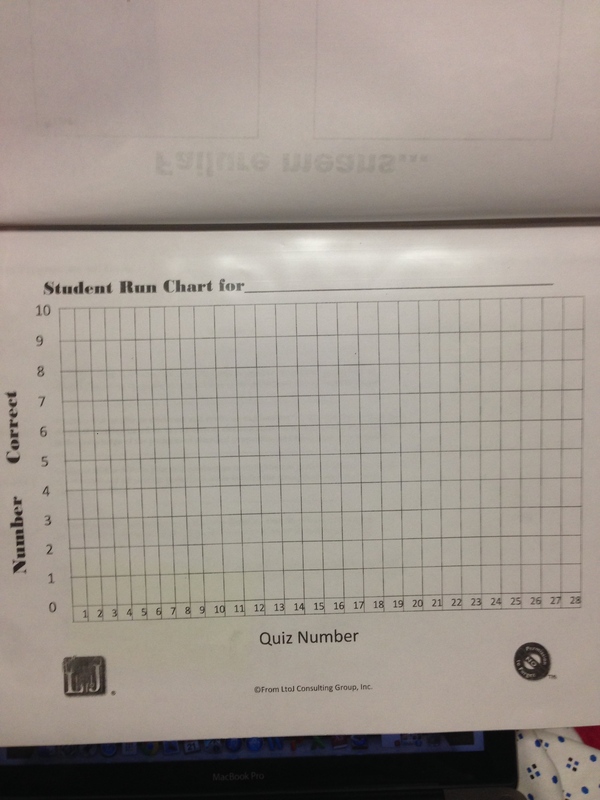 Students will have one “test” that determines their level of understanding for that standard at the end of the lessons. The test asks students questions at each level of the learning scale and a final score is determined by the average. I will go into more details of this when my students take their first test! So far they seem to like the set up. They enjoy the mini-quizzes/questions at the end of each class and how I use them to start the beginning of the next class. Their questions are more specific which helps direct our conversations! Now I’ve missed more school due to my health so a test update may be a couple weeks away. In the meantime, I will make some posts more specific about my lessons and how I’ve developed the learning charts. Hopefully I’ve raised some questions or helped bring to light some ideas you can use in your classroom! Feel free to emails me if you need to!